Even before the events began, we had the fortuitous opportunity to interact with not only people who had done tremendous human rights work across the world, but also students, professors and business people from New York who were interested in the nature and breath of the conference. The walls of the buildings were decorated in such a way as to educate young leaders about the various ways to be aware of and avoid surveillance. In the middle of the auditorium was a huge map which displayed the number of freedom/not free/partially free countries in the world, and it took some time to grasp that the very world of freedom we enjoy is an anomaly to most of the world which is either receding toward chaos or is already filled with brutality. 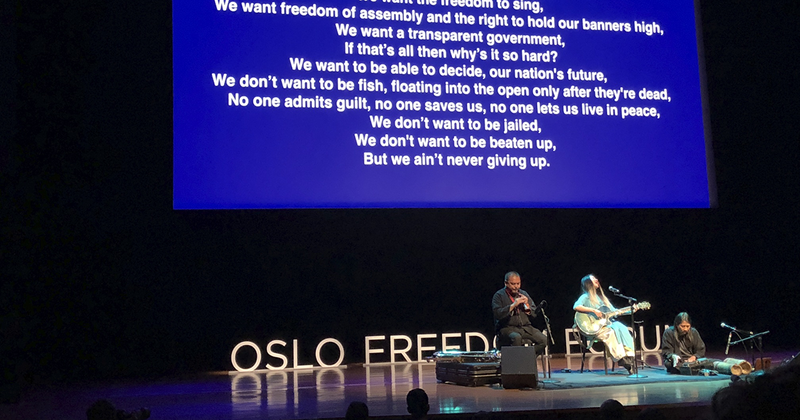 From the get-go, we had the opportunity to listen to the inspirational Vietnamese musician Mai Khoi, who used her music and her popularity to seek a seat in Vietnam’s one-party government. Though she inevitably wasn’t allowed to contest, her efforts to confront the system were nationally broadcast. She even met with President Obama on his visit to Vietnam. Fatemah Qaderyan: the captain and spokesperson of Afghanistan’s all female high school robotic team who won a silver medal for Courageous Achievement in Washington D.C after her team’s visa was denied. Days after returning to Afghanistan from the U.S, news broke that her father had been killed in an ISIS-related bombing. Farida Nabourema: a Togolese writer and blogger who co-founded the “Faure must go” movement, which was a hallmark of Togolese struggle against Faure Gnassingbé’s oppressive rule. Fang Zheng: a Chinese activist and lifelong athlete who was run over by a tank during the Tiananmen Square student protests of June 4, 1989. Despite persecution, Fang has continued to fight the government’s narrative that he and his fellow protestors had used violence against government troops. These are in no way all the inspirational and interesting speeches I heard, and the aforementioned descriptions can in no way portray their lived experiences which were very powerfully shared with us during the forum. I left the forum with a renewed sense and appreciation of the rights I enjoy and a motivated desire to help create change in places of the world where we are not as lucky as here. It recreated in me the notion that it is perhaps in the smallest or the least anticipated of actions that a fire can kindle and in many places of the world, it is this spark and glimmer of hope that people are looking for. Any individual can create change, and if you have the courage and desire, you can too. To watch the entire event which happened in New York, find the link here.